Dorion Morgan serves as Burlington Township Municipal Public Defender and is senior pastor of the Restoration Station Christian Fellowship. 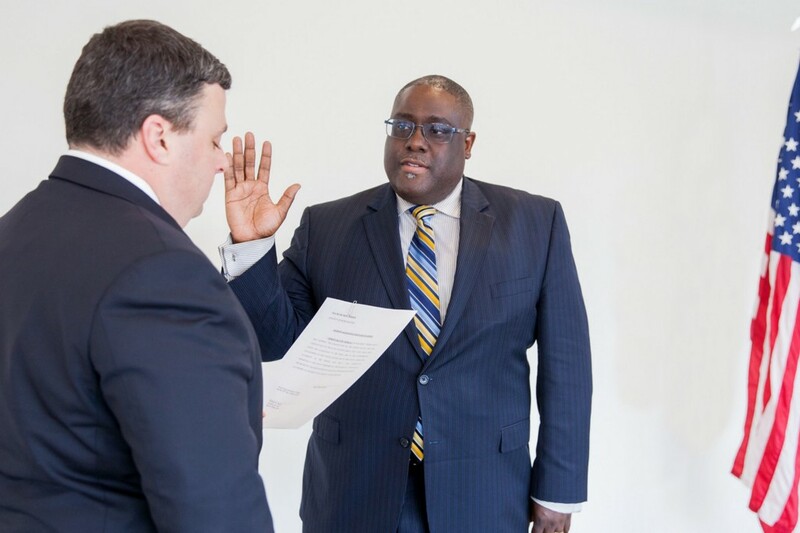 Rowan College at Burlington County Board Solicitor William Burns swears in Dorion Morgan to the college’s Board of Trustees at the March 29 meeting. Morgan, who operates his own law office, has served as the Burlington Township Municipal Public Defender since 2003. He is also the founder and senior pastor of the Restoration Station Christian Fellowship — a non-denominational multicultural Christian church that officials say strives to positively impact the community through service and outreach. Morgan holds a juris doctorate from Rutgers University School of Law in Camden. He has focused his practice on municipal court matters, real estate, criminal, landlord/tenant and adoptions. According to officials, RCBC has achieved three consecutive semesters of enrollment growth since it transitioned to the Mt. Laurel Campus and became the first community college in the region to offer junior-year courses as part of the 3+1 program. The 3+1 program allows students to complete 75 percent of their work toward a Rowan University bachelor’s degree at RCBC, which officials say has lowered the total cost of a bachelor’s degree to less than $30,000.